I hit a wall last week, figuratively speaking. I’ve been so utterly consumed with projects on my to-do list that I’ve neglected the basic necessities. You know, important stuff like sleep, food and time with friends. A person can only neglect that stuff for so long before she breaks down and calls her mama and cries. And by “a person,” I mean me. In hindsight, I’ve been trying to do way too much at once and I’ve been trying to do it all myself. Examples: applying for a trademark, installing my new light fixture, hemming and hanging curtains, redesigning this website, taking my dog to the vet three times a week, obsessively baking brownies, like, six times until they are just right, and, well, SEND HELP. If there’s ever a time to hunker down and work on some projects, though, it’s during the depths of winter. Now that the weather is warming up and my to-do list has fewer ambitious projects on it, I’m ready to take it easy. For starters, I’m forcing myself to go to bed at a reasonable hour. I also invited my friends over for girls’ night last night. I made them this redeeming and restorative green soup, which our friend Tessa had made for us at a girls’ night past. The recipe came highly recommended from her coworker. I liked it so much that I thought I’d share it with you all. I’m well aware that this soup is mossy green and won’t win any beauty pageants. However, I’m gonna do my best to sell you on this soup because it’s truly delicious. Slow cooked, sweet caramelized onions contribute tons of flavor and balance out any bitterness present in the greens. A small amount of starchy arborio rice blended into the greens helps thicken up the soup and makes it a little creamy (without any cream). Finally, cayenne pepper and lemon really punch up the flavor. 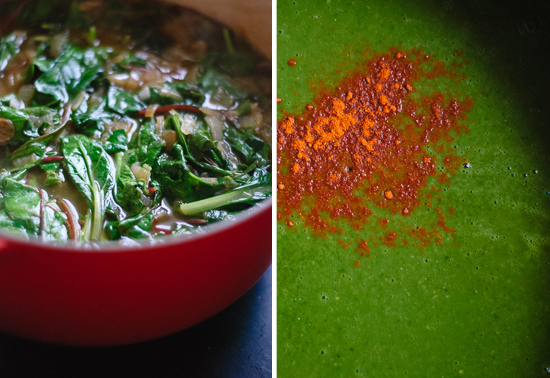 If you’ve ever experienced kale belly, which is what I like to call that glowy, life-is-good feeling that emanates from your belly after you eat a bunch of kale salad—this soup does the trick, too. Maybe it’s all the vitamin C.
There are a couple of ways to serve this soup. As a simple bisque, this soup would be a great side for a sandwich or avocado on toast (serving it with a salad might be a little redundant on the greens). If you want to turn it into a full meal, I suggest serving the soup on a bed of brown rice (I like basmati) with chickpeas. My friends and I really liked the chickpea addition, which adds both texture and protein. You can also swirl a little olive oil on top to add some richness and up the satiety factor. Definitely sprinkle it with freshly ground black pepper and a squeeze of lemon juice. This soup is just crazy good and crazy good for you. A super fresh and healthy soup filled with greens and seasoned with lemon juice and cayenne pepper. This recipe is vegan and gluten free. The soup requires some multitasking; you’ll be caramelizing the onions in a skillet while you cook the rice and greens in a pot. If you’re cooking additional rice as a garnish, you’ll need one more pot on the stove (see notes for rice cooking instructions). Recipe yields 6 servings of about 1 ⅔ cup soup each. First prepare the greens: Remove the ribs from the chard/kale and discard or save them for another recipe. Coarsely chop or tear the kale leaves. Trim any tough stems from the spinach/baby greens and roughly chop the leaves. Caramelize the onions: Heat 2 tablespoons oil in a large skillet over medium-high heat. Add onions and ¼ teaspoon salt. Cook, stirring frequently, until the onions begin to brown, about 5 minutes. Reduce the heat to low, add 2 tablespoons water and cover the skillet (I used a baking sheet to cover mine). Cook until the onions are greatly reduced and have a deep caramel color, 25 to 30 minutes. Stir frequently while the pan is still hot and occasionally once the pan has cooled down (always recover the pan after stirring). Cook the arborio rice: While the onions are cooking, combine the remaining 3 cups water and ¾ teaspoon salt in a soup pot or Dutch oven. Add rice and bring the water to a boil. Reduce heat to maintain a simmer, cover and cook for 15 minutes. 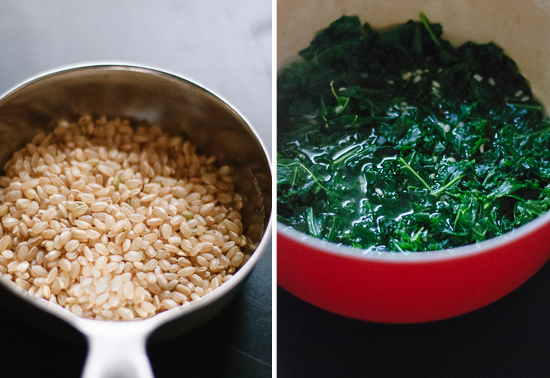 When the rice has cooked for 15 minutes, stir in the chard greens or kale. Return to a simmer; cover and cook for 10 minutes. When the onions are caramelized, stir a little of the simmering liquid into them, then add the onion mixture to the rice along with the spinach/cooking greens, broth and cayenne. Return to a simmer, cover and cook, stirring once, until the spinach is tender but still bright green, about 5 minutes more. Puree the soup in the pot with an immersion blender until perfectly smooth, or in a regular blender in batches (never fill your blender past the maximum fill line, and be careful with hot soup). Stir in 1 tablespoon lemon juice. Taste and add more lemon juice, sea salt or cayenne pepper, if desired. Garnish each bowl of soup with a drizzle of olive oil. Divide the soup into bowls if you’re serving it as a bisque, or serve in bowls over cooked rice and chickpeas for a more complete meal. Garnish soup with a swirl of olive oil if you’d like. Serve with lemon wedges and freshly ground black pepper on the side. Adapted, not a whole lot, from Eating Well. I used store-bought, washed baby greens for ease of preparation (more specifically, ¾ths of a giant container of OrganicGirl’s Super Greens). Organic greens are always best because conventionally grown greens tend to absorb a lot of the pesticide used on their crops. How to cook brown rice to serve with soup: Bring a large pot of water to boil on the stove. Rinse the rice (1 ½ to 2 cups should be plenty to go with the soup) in a fine mesh colander. Once the water is boiling, pour in the rice and give it a stir. Boil the rice for 30 minutes, then turn off the heat and drain the rice. Return the rice to the pot and cover the pot. Let the rice steam for 10 minutes. Remove the lid, fluff the rice with a fork and season with sea salt to taste. Whoa, busy girl! Don’t forget to take a nice little break :) Kale belly, haha, I think I know exactly what that is :D I hope things settle down for you soon. This soup looks perfect for de-stressing! Kate, this is just the kind of meal I need in my life right now. Delicious, yet healthy and nourishing. I’m going to stop on my way home from work to pick up the goods to make this soup tonight. Can’t wait! Take care of you! Amanda, thank you! I hope you enjoyed the soup! Cheryl, I hope you both love the soup! Cookie is finally done with therapy and she is almost back to 100 percent. Hydrotherapy really worked wonders for her! I hope your dog is feeling better now, too. Thank you Kate for the lovely recipe. Cookie is so cute. Have a Sunny Day! Thank you, Liz. Happy first day of spring! Sometimes the perfect remedy is a good cry and a big bowl of soup! Yes, I’d say that stuff is pretty important! Glad you got some time with some girlfriends. I definitely could use more time with girlfriends. Totally important! I easily start to feel isolated since I work from home and I’m single. I have to be careful about that. I think you would enjoy this soup! Ah, I think anyone who is at home for most of the day (single or married, kids or not) starts to feel isolated after a time! I try to get together with a friend at least once a week. Of course I have my kids to keep me company, but that doesn’t totally ease the isolation factor of working from home. True! It’s always important to make plans with friends. Kale belly is the real deal! :) I was struggling with these photos… weird green soup, diminishing natural light and my favorite lens stopped working (whyyy?) so I am glad that you like the photos! Thanks, Sophie. Ohhh just what the doctor ordered. Everything you are doing is awesome… keep up the good work!! I need some of this in my life right now. I feel like I have been eating way too many carbs and meats. I need some veggie love in my belly! Wow- now that is a gorgeous moss green soup! Beauty pageant winner for sure. Don’t sell her short. Love the addition of rice and especially the chickpeas because I could eat those plain all day everyday. Thanks, Jessica! The rice and chickpeas are really complementary flavors and make for a much more filling soup. Hope you’ll give it a try soon! This soup is gorgeous to me. Sound delicious too! This looks SO delicious! And healthy. I’m going to have to try this out. This looks absolutely delicious! perfect fuel for hectic weeks. I am so impressed at you hemming your own curtains! I think this soup is beautiful. I love that green colour. Soup always seems magical to me. It just takes a few simple ingredients to produce something utterly wonderful! Pinned this one. I’m glad you had a much-needed girls night with your friends! A little friend time can go a long way. I am going to need a big bowl of this soup after my birthday week ends! I love your idea of serving it with brown rice and chickpeas. Thanks, Taylor! And happy birthday week!!! i really love how this soup comes together here – all the ingredients and flavors, from the caramelized onions to the cayenne, seem to be super complimentary to one another. 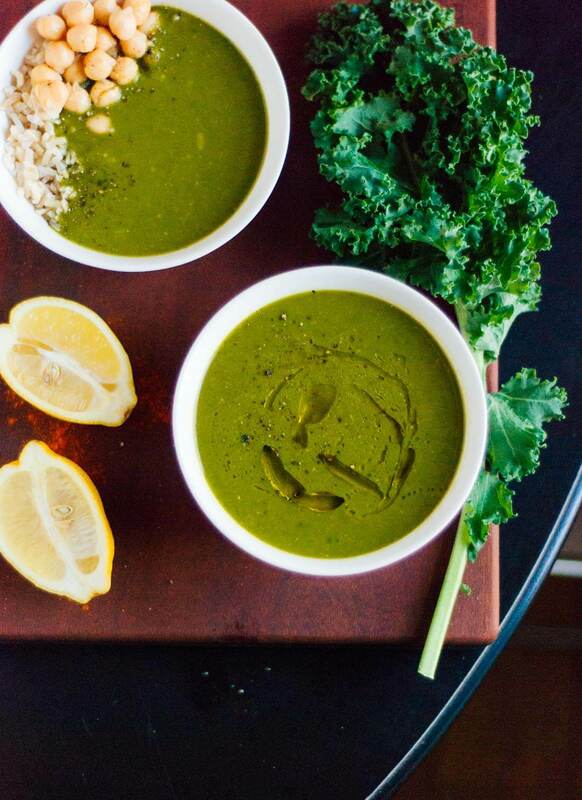 and yay for green soup, something bright and fresh for spring! Thanks, Lindsey! It’s amazing how how much more flavor onions have once they’ve been slow cooked and caramelized. I think you would love this soup. Happy first day of spring! Your term “kale belly” cracks me up, but it exactly describes what happens after you eat it. This looks delicious! Right?! If only all foods made me feel as good as kale does. This looks so lush and just what I would love for lunch. Cheers to taking it a little easier this spring. I can totally relate to tackling too many projects at once. Thank god for girlfriends and lovely soups like this. Stunning! Hope you love it, Mia! Hooray! Glad to hear it, Mia. Kate, this looks like the most delicious way to take care of yourself I’ve seen all week! I know that “too much too fast” feeling, and I’m glad to hear you are trying to take it a little slower. So if you figure out this whole trademark thing, you can share your secrets with me. I’ll bake you cookies in exchange! And you don’t have to tell me twice to make this soup! I love the mossy green-ness. I figured it out! First you have to make sure your brand name is copyrightable. Then you can look up a bunch of other food bloggers’ trademarks to see how they filled out their trademark forms. You basically just have to pick the right category (google can tell you which one to pick for blogs) and write a one to two sentence summary of your business. It costs a few hundred dollars. I want kale belly! This looks and sounds great. I’ve never had a green soup before, but you don’t have to ask me twice. Pinning this now! If soup can be redeeming, then I must try it right away. The way you describe it makes me want it in my life immediately! Thank you, Erin. Moms are always good at telling us to get some sleep, huh? Hope you’re well! This looks delish! But is it really 14 cups of spinach?? Yep, 14 cups! It cooks down a ton. I used 3/4ths of one of those family-sized organic washed greens packages. Kate, your recipes are so satisfying and healthy! I am not a true vegetarian but will often make one of your dishes weekly. I love anything with black beans and kale! Anyway, if one did not want to take the time to carmelize the onions, would simply cooking them in olive oil maintain the basic flavor of the soup? Hey Alison, thank you! I’m so glad you’re enjoying the recipes. 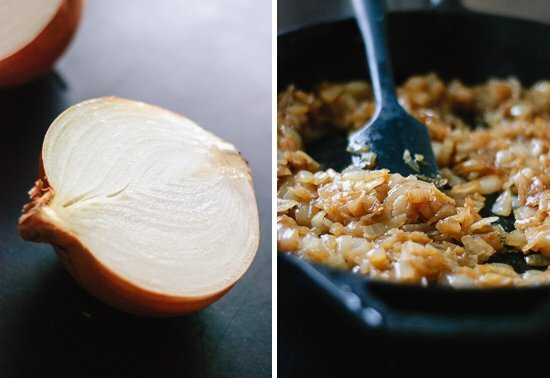 You could cook the onions for 5 minutes instead of going to the trouble of caramelizing them, but I do believe you’ll miss out on some wonderfully complex and sweet flavors. Up to you! Have you made this without adding the rice into the blender? This seems like an odd thing to do, to me. I’ve never tried! No, I haven’t tried that. Arborio rice is starchy, so by blending in the cooked arborio rice, it helps thicken the soup and make it creamier. You can omit it if you want, but I really think it improves the texture, and you can’t even taste it. The green soup is definitely redeemed for me. I love the recipe. 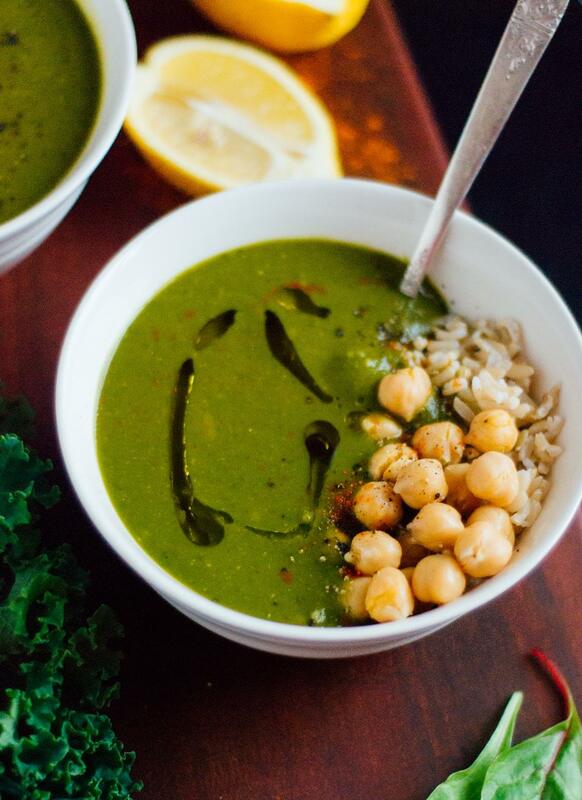 Love the idea of adding rice and chickpeas as a “side” to a soup! You could put chicken on top if you’d like! I also think it would be very nice with a side of grilled fish. I’m thinking a spicy, smokey sausage (pork, chicken, soy, etc), grilled and thinly sliced on top could also be a yummy protein addition! I swear we are on the same brain wavelength. I was just dreaming up a soup full of pureed greens last week when I was feeling the need for Spring refresh BIG TIME. Then just days later you post this. Seriously?! So cool. Can’t wait to try this. Ever since this posted I have been dying to try this soup. I made it tonight and it was perfectly wonderful. I am already craving leftovers for lunch tomorrow! I’m so glad you enjoyed the soup! Thanks for commenting! I hope you are feeling better Kate. They always say you feel better when you cry in front of someone (or in your case, on the phone with someone). I made this soup yesterday. I used brown rice because I didn’t have brown arborio rice. I also added fresh cilantro, parsley and mint and it’s delicious! Sandra, thank you. I seem to be going through a bit of a rough patch lately. I’m so glad you enjoyed the soup. I bet the added herbs were lovely! This soup was pretty good when I first served it, but I had to add a bit more seasoning for my tastes (extra garlic and cayenne, salt, some coriander, lots of lemon). It also quickly got ‘filmy’ when I removed it from the heat, and later in the fridge, though well-covered. I just tried to eat some tonight and it had gotten so gloppy and texturally weird that I couldn’t finish it. Perhaps this isn’t a great soup for leftovers? Hey Sarah, I’m sorry the soup didn’t turn out just write for you. This soup isn’t as boldly flavored as most of my recipes, but I thought the caramelized onions add a lot of flavor. My soup never got filmy or gloppy so I’m a little baffled by that. My Blendtec blender is pretty great at blending soups smoothly. I wonder if your soup never got super smooth, so the particles separated? Not sure what else it could be. I made this just now… and I was skeptical that a lot of not so cheap greens would go to waste into some disgusting concoction… BUT IT’S SO GOOD. Amazing. Thank you for sharing :) So excited for my kale belly. I got home from a loooong weekend of having way too much fun with old college friends and was craving something healthy and homemade. I found this recipe and immediately went to the store to buy the ingredients. Loved it! I served with short grain brown rice and a extra squeeze or two of lemon juice. Delish! That’s great! Glad you enjoyed it! I made this last night for an evening with friends, and – YUM! Thanks for the recipe! Annette, so glad to hear that you and your friends enjoyed the soup! 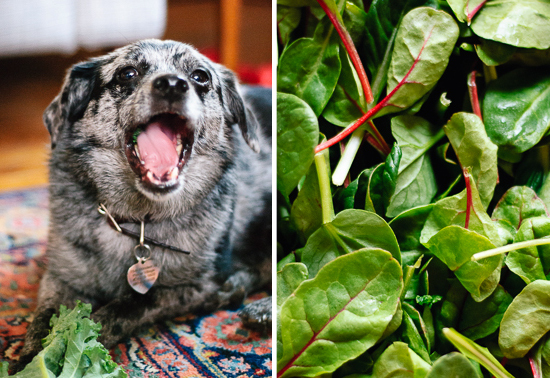 Ooooh – Kale Belly in a good way? Sounds just like my Gluten Belly (which is not in a good way!) I have a lovely bunch of organic kale in my kitchen right now, that I have been wondering what to do with and. this will be my lunch today, thank you! I hope you get some more you/friend time over the Easter long weekend. Thanks, Susan! Hope you loved the soup. The first time I made this soup, I put it in my food processor, and it exploded all over me and all over my kitchen. I got some great disaster photos!……. But!!!!!!!!!!!!! The end result tasted great, so explosions aside I was pleased. The first time around I subed the rice and just put in chickpeas to add the thickness. Tonight I made the soup again and went with the brown rice, tried to play by the rules. No mess….. but honestly the chickpea thickener was much more to my liking, I guess I’m just not a fan of the flavor of rice but love chickpeas….. all together great super healthy soup. I always love new ways to eat tons of KALE! My fav! Thanks for the creation. Oh no! I’m sorry the soup made a mess of your kitchen. Good idea to add chickpeas—that’s easier, too. Some people don’t love chickpeas (crazies!). First of all, your recipes and your site is my go to. Thank you for helping me transition to a mostly plant based diet. Second, I’m making this soup now and perhaps I’m just missing this, but I see that veggie broth is listed in the ingredient list, but I don’t see where to use it in the instructions? In place of the water? Hey Christianna, glad you found it! I’m delighted to hear that my blog is your go to. :) Thank you! love this recipe, and the beautiful photos! I’ve made it twice now and the second time I simplified it a bit – I didn’t bother with arborio rice, I just boiled the kale in a little less water, added the caramelised onions, broth and spinach, then blended it as instructed, and it tasted just as thick and delicious but required fewer stages. I also used cumin instead of cayenne pepper and that worked well. Thanks for the wonderful recipes! I made this last night and it was so delicious! We ate it with baked halibut as our main course. Thank you for highlighting the recipe. Scarlett, I’m so glad you enjoyed the soup! Sounds like a delicious meal. First, I have to say that I love your blog and am constantly making your recipes- they are all devine and perfectly done! This particular one I had some trouble with, however. I couldn’t see where to use the 4 cups of vegetable broth so I ended up blending it in with eveything at the end. Did I miss a step? I thought it needed something sweet at the end so I ended up reducing some red wine and adding at then end to the blended soup. It turned out delicious but I’m stumped on the broth part- let me know when you added this! Thanks and I hope you had a nice weekend!! Hey Courtney! I’m glad you enjoyed the soup. Your version sounds great. I specified to add the broth in step six but it would be easy to overlook that part. Sorry about that! Glad you both enjoyed the soup! Yay. This recipe looks delish! I just have a question about this instruction in your recipe. What “simmering liquid” are you referring to? The liquid from the rice/kale/chard pot? I pride myself on my soup-making skills. I love soups and I make them often. Now to this soup: A M A Z I N G! I was so blown away by the taste of this soup. Perhaps the risotto and onions? Or all the array of healthy, tasty greens? Perhaps just the combo. You have to try this soup. My husband LOVED it and he’s not a fan of thick and hearty soups. I made everything in one big pot. Cooked onions, then added arborio rice, then made a risotto then added more water when I added greens. Final step was to blend. Simple and nutritious with flavor over-load! This is a keeper for sure. THANK YOU for a super recipe!!!!! Thank you, Trish! So glad to hear that this soup gets your stamp of approval! My doctor recently took me off all grains and told me to eat green veggie soups. Your recipe seems yummy, but I’m wondering if I can substitute something for the arborio rice? Hi Dinah, that’s a good question. I can’t think of a replacement that isn’t a carb/starch. I think you could just omit the rice completely. Your soup won’t have quite the body that mine had, but I think it will still be great! Also potatoes and carbs in general. I’m off grains and fruit. What about quinoa or chick peas? I think either would be great! I made the soup with White Kidney Beans instead of rice. It is delish. I love the hint of lemon. Thanks, Dinah! Glad to hear it! I made this, but I added garlic, kept the rice on the side, and served with Flatbread. Also, I wasn’t convinced that removing the stems (those are the “ribs”, right?) was worth it, especially since it’s all getting blended anyway. Thanks for the idea, and great recipe. :) it tastes great! Thanks, Tyler! Good point about the ribs. Hi Kate! I’ve been following your blog for about a year and a half now, and I love it! I’m late to the game with this soup, but I’m planning on making it tonight!! One question — how well do leftovers keep? I’d hate for the soup to go to waste if I can’t eat it fast enough! Hi Kaitlyn, I’m sorry for my delay! I’d say this soup, and most soups, will keep well for about five days. Great recipe, I had black cabbage so used instead of Kale. I rarely measure anything so the consistency was quite thick but I watered it down. I added too much Cayenne! So added cream to dull the burn. Fantastic soup, thanks for the inspiration. Thanks, Liz! Glad it turned out well for you nonetheless! I love, love, love this soup! I make this recipe regularly and eat the leftovers for several days. I almost always add sweet potato, as well. Just peel, cube, steam, and blend in! It adds even more smooth texture, great flavor and extra nutrients. I love the chickpea addition and will try that this week. Thank you! Thank you, Amy! Great idea to add sweet potato! Thank you, Erin! Happy to hear it! I made this today and it was easy and so tasty. I used kale and spinach. I’m about to make this green soup and blow some minds. Quick question: Do you blend the rice together with the onion/greens in a blender?? I made this the other day over rice and chickpeas for dinner…it was amazing and sooo filling. I ate it plain for lunch the next day and it hit the spot again. Thanks so much for such a good recipe! This recipe is absolutely delicious. It’s a new favorite of mine! Thanks for sharing! 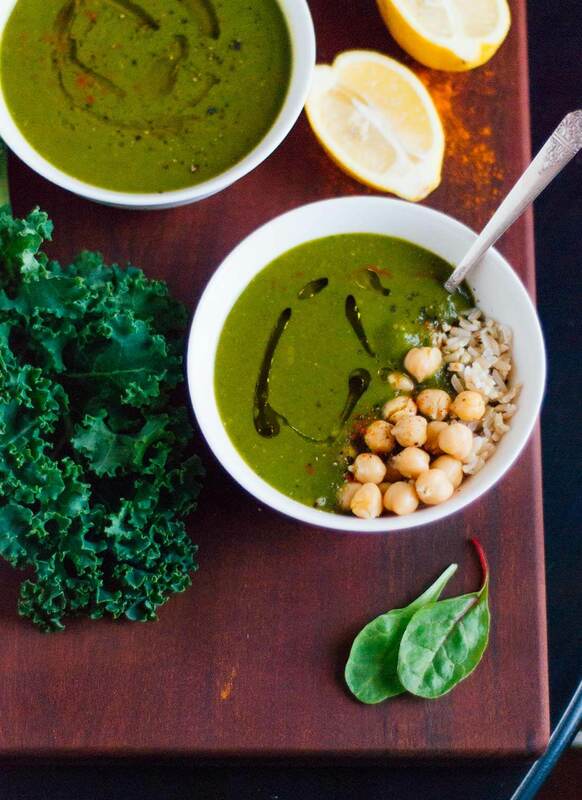 This is one of the best green soups I have ever had! Just fantastic! My very discerning husband and mother-in-law just love it. Thanks for sharing this beautiful and nourishing recipe. However it is actually the best soup I’ve ever tasted and I’ve made it so many times. Sooo good!! Wow! I just made this and I can’t believe how creamy that little it if rice makes it! I added 1.5 tsp ground turmeric at the cayenne phase, as well as 3 cloves garlic to the onion phase. I used the juice of a whole lemon and then once the soup was made added a cup of cooked lentil mix (freekah, lentils and beans). My 2.5 year old son demanded some of what I was eating and has eaten a pretty decent bowl of it, too! Going to portion his for work lunches – it’s winter here in Australia and this is perfect. 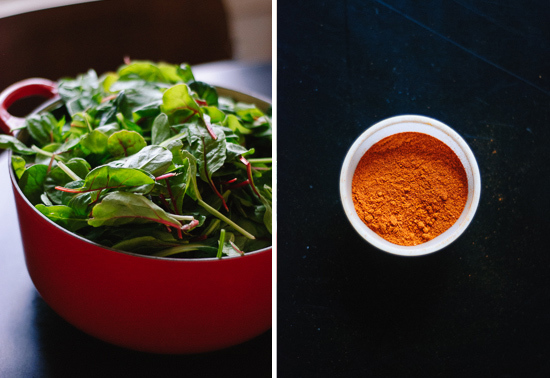 I made this recipe as is (I was probably very liberal with the cayenne), and it is amazing! 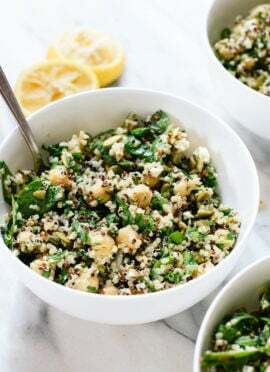 Served over brown rice/quinoa and chick peas and it’s very filling/satisfying. I’m so glad you enjoyed it, Chris! Thanks for letting me know. Just wondering, do you have any suggestions for things other than Arborio rice that can be substituted to give the soup that nice creamy texture? I have some sweet potatoes and squash on hand and was wondering if some sort of puree of those might suffice. I’ve been churning out tons of meaty dishes for my boys. Ugh! The nest is empty now. Grandma gets to cook and eat all the veggie meals she has lusted for. Your recipes = my bible now. Love your recipes. Life is good now. Hubby, not so gleeful but our Doctor scared him into compliance. He has actually admitted to liking most of your recipes. Many thanks from grandma Mo. 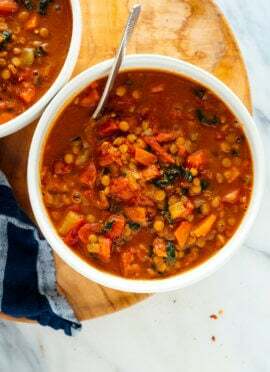 Such a delicious and healthy soup! Thank you :) I have never been disappointed in one of your recipes. Really easy to make and unbelievably delicious. I was surprised by the earthiness of the flavor, which you can also play with using the lemon and paprika. Shared it with friends and they also loved it. Thank you! You’re welcome, Kristen! I hope your friends enjoy as much as you do. Excellent recipe. I modified it slightly. Added an organic potato in lieu of rice. I also crushed a bite sized ginger piece and dunked it into the puree while warming the soup. Very tasty! I keep trying green soups and haven’t found one I was really excited to make again. Until this one. Even one of my kids liked it. I think next time I might add some split peas to make it a little heartier on its own, but I loved the cayenne kick (1/4 tsp) combined with the lemon (1 wedge extra per bowl). Thanks for the recipe! You’re welcome, Annette! I’m glad you found what you were looking for. Would love to see nutritional information. Hi, Erin– Unfortunately, I don’t have nutritional info available for my recipes just yet. I’m looking for a solution, and will update about it once I find one. Thanks! thank you for this delicious recipe, it was very nourishing and made me feel strong! That’s all I could hope for, Soraya! Made this soup yesterday. This soup is simply fabulous. The cayenne and lemon are perfect! The drizzle of olive oil at the end makes it lucious. Thinking I need a bowl of this for breakfast! I love the silkiness of this dish, too! Thanks, Joy. One more great recipe! 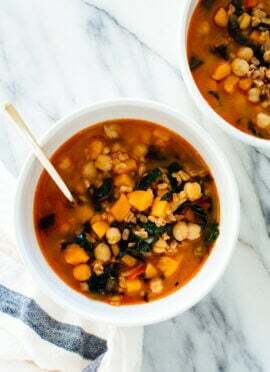 This soup is super easy to make, really healthy and most of all delicious. I doubled the recipe, threw in some minced garlic with the onions, extra cracked pepper and used collard greens instead of kale because that’s what I had on hand. The lemon juice really brightens up the flavor. Thank you for a delicious dinner! Thank you, Helayne! You are welcome. I appreciate the star review. I have been making your recipe for a few years now, and wanted to finally send a ‘thanks’ your way :) The whole family enjoys it, most impressively, my son – now 13. We often reference ‘that good feeling when you eat lots of kale’ (kale belly!) Thank you for sharing, I’m so glad to have this in my arsenal of healthy but tasty meal options – especially after some serious holiday indulging! I subbed some cauliflower rice for the arborio rice because it’s what I had on hand (I’m sure quite different than what it should’ve been, but oh well) + also put in extra cayenne and lemon juice. Tasted great, especially with chickpeas – thanks! Great! Thank you, Jordan for sharing and for your review. We don’t have to cook but we all love to have soup. We always want to try some new recipes of soup. This soup is very easy to cook and can be cooked instantly. I am trying this for sure! I’m happy to hear it was easy for you and you liked it! Do you think this recipe would do alright if I cooked it the day before and then reheated it in a crock pot? Sure! I haven’t tried it yet, but soup is usually a great option to reheat. This soup has become a staple in my house. I always make mine with kale and spinach (and a little extra cayenne!). I think what makes this recipe so such successful is the carmelized onions. Don’t skip that step! Because even though it has just a few ingredients, this soup does not lack in flavor when made as directed. To make it a meal, I usually serve with farro or bulgur and garbanzo beans. Hope you enjoy it too! My husband and I love this soup! The caramelized onions are incredible. Sometimes we serve it over roasted cauliflower if we’re out of chickpeas. Thanks for this awesome recipe! Oh that sounds like a nice way to have it, Rachel! Thanks for sharing. This is THE BEST soup ever! My dad and I have made is several times! This soup makes me feel so energized and healthy. I used quinoa instead of rice and served it over chickpeas and it was delicious. Thank you! Wonderful, Kristen! Thanks so much for sharing. I made this tonight for dinner. I was soooo skeptical until the moment I tasted it. It is delicious and unique and refreshing. I kept going back for more due to its refreshing lemon taste and the mild after bite of cayenne. And it’s guilt free! I’m glad you made it! Thanks for sharing, Carrie. Made this recipe last night and I am a huge fan. I had to leave out the arborio because I am lazy and didn’t want to go to the grocery store. I also added a lot more cayenne, 3 table spoons of butter, lots of black pepper, and served with a dollop of ricotta cheese. Thanks, Kate! I am a huge fan. I will now work through all your soup recipes this winter. I have to say, I was skeptical. But like you, Kate, I was in need of some intensely wholesome food. I just devoured my second bowl. This is seriously good soup. I can’t believe how creamy it is. This’ll become a staple in my house for sure. Thank you for all your amazing recipes! I’m glad you tried it! Thanks for sharing, Leanne.